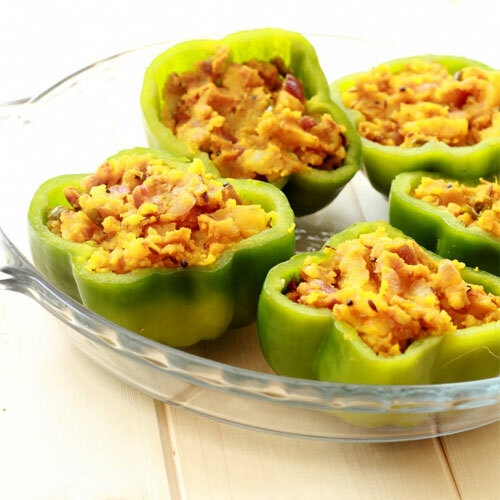 This is a flavorful and exotic side dish prepared with stuffing capsicum with spicy potato. Combine the mashed potatoes, green peas, onions, paneer, ginger-garlic paste, coriander, turmeric powder, garam masala, raisins, chilli powder, salt and lime juice, mix well. Heat 1 tbsp of oil in a non stick pan add the potato mixture and stir for 5 minutes. Remove from the flame and allow the mixture to cool. Keep aside. Cored the capsicum and remove all the seeds. Fill the potato mixture in each capsicum and press to close it. Heat the remainig oil in a non stick pan and add the cumin seeds. When the seeds splutter slowly put the stuffed capsicum in the pan and cover the pan. Cook on slow flame for 5 to 8 till the skin of capsicum becomes soft. Serve hot. It can be served to 3 people.